Now available for directly from O'Reilly or Amazon. 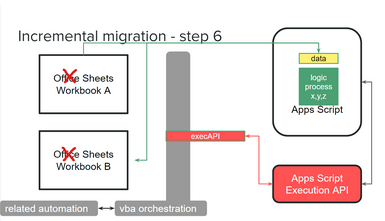 Now the data has been migrated, the logic migrated and the orchestration is now managed by Apps Script. In most circumstances, the job is done, but there may be some circumstances (legacy databases and systems automation for example), where automation needs to remain on VBA for some time. If this is the case, careful attention should be given to quotas and timeouts. In other words if the processes running on Apps Script become too long running, or their results take too long to come back, they may need to be split into smaller chunks. In any case, any incremental migration project needs as much planning and preparation as a straight cutover and should not be considered as the final operating model.